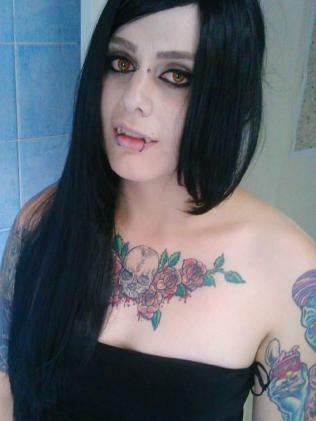 GORY scenes of a man spurting blood after an axe attack have been shown in court at the trial of accused attacker Evie Amati. 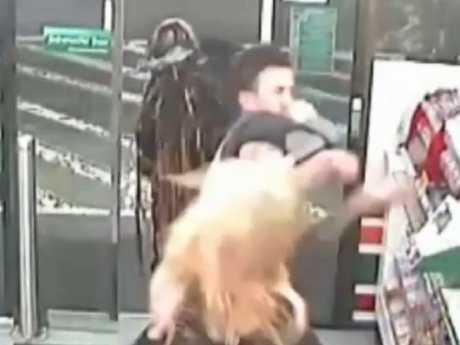 Sitting in the dock of the District Court, Evie Amati, accused of the attempted murder of two 7-Eleven customers in a suburban Sydney store, put her head in her hands and wiped her eyes as CCTV was shown to the jury revealing the shocking scenes of the attack. 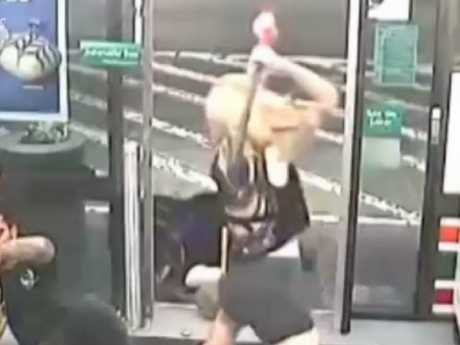 In the video, which shows internal footage from Enmore 7 Eleven in the early hours of a January 7 last year shows the accused dressed in black strolling in carrying an axe. She then does a lap of the store passing customer Ben Rimmer in the aisle. Mr Rimmer then queues behind another customer, Sharon Hacker. Evie Amati then approaches Mr Rimmer and stands very close to him, chatting. Mr Rimmer appears to touch the axe which Ms Amati holds in two hands in front of her. Mr Rimmer appears to make a joke and continues chatting with Ms Amati as she stands holding the axe. Another customer, Sharon Hacker, appears to be finishing her purchase at the cash register ahead of him, Mr Rimmer turns slightly away from Ms Amati. Ms Amati can be seen entering the store carrying the axe. Ms Amati then swings the axe above her right side in both hands and brings it forcefully down on Mr Rimmer's face. He falls to the ground. The video shows Ms Amati swing the axe up again and bring it down on the back of the departing Ms Hacker's head. Ms Hacker then falls forward to the ground. Ms Amati then steps towards the shop door and swings the axe above her head once more and brings it down forcefully in the region where Ms Hacker is lying. Footage of the aftermath the attack show Mr Rimmer covered in blood, blood on the floor and him pulling off his T-shirt as blood continues to flow from his head. Ms Hacker then stumbles back inside holding her head. 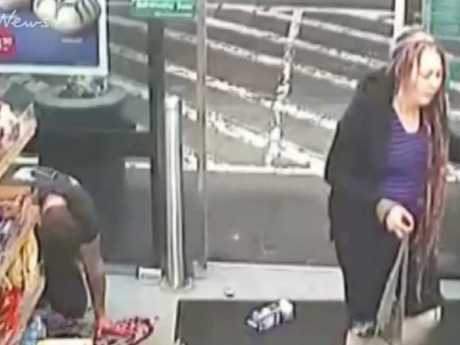 Footage outside the shop shows Ms Amati strolling off carrying the axe off the service station premises. The CCTV video shows Ms Amati swinging an axe at Mr Rimmer at the counter. Ms Amati then takes aim at a second customer before stepping over her and leaving the premises. 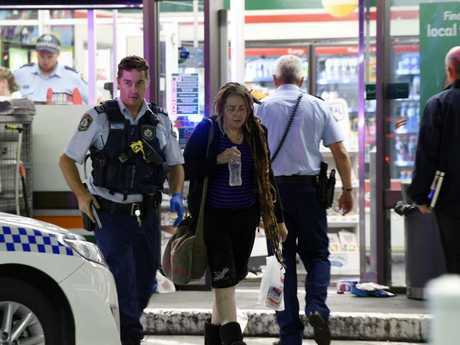 Police officers told the trial that they converged on Enmore 7-Eleven in the early hours of January 7 2017 after police radio broadcast an alert about "a female armed with an axe". 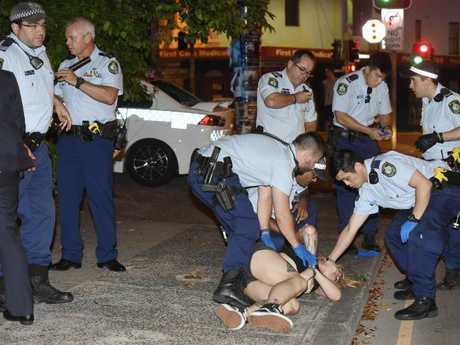 Constable Peter Leong told the court that he and another officer searched on Stanmore Road, Enmore "in case she was hiding". In the front yard of a hairdresser's shop on Stanmore Road police spotted "a pair of caucasian legs ... with a zombie tattoo". An axe propped up on his blade was left against a wall. 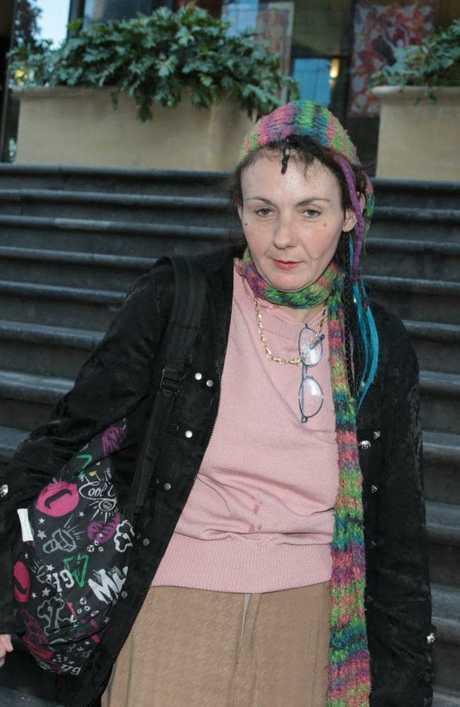 The court heard that Ms Amati was carried out onto the road and was "limp ... a dead weight". The accused was taken to St Vincent's hospital by ambulance in which paramedics placed a tube into her nostril to help her breathe. Senior Constable Christopher Young told the court that after the accused was "stretchered into the emergency area [she] opened her eyes... pulled a long tube out of her nostril and threw it away." Senior Constable Young said when asked her name, the accused replied, "I'm not telling you. I don't have a name". He said that she "had a smirk on her face as she spoke" and was "moaning, licking her lips and saying f**k me, f**k me, f**k me." The two customers are left in the store, with blood spurting from Mr Rimmer’s head, until police arrive shortly after the attack. Earlier, a witness in the trial gave dramatic evidence describing how Ms Amati came out of a 7-Eleven with an axe dripping with blood. 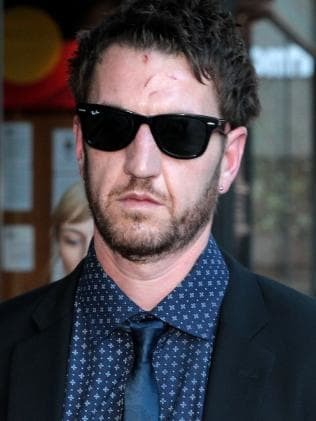 Nathan Wood told the court that he was walking home after 2am on January 7 last year when he saw "a fight inside ... some goods inside the shop getting knocked over". "I saw a person inside raise an object from overhead and down hard with it," Mr Wood said. "That's when I saw a body on the floor and blood spatter. "I saw a second body collapse to the floor. "And I saw Ms Amati exit the building with a dripping axe. "She has locked eyes with me and was crossing straight towards me. "She started to raise her axe. I realised she was intending to do harm so I made a mad dash to the end of the block." Mr Wood said he then saw a homeless man he later found out was Shane Redwood. "Shane was right behind me," Mr Wood told the court. "I watched [the accused] take a swing with the axe at Shane." Mr Redwood gave evidence of the incident via video from the UK. Mr Redwood, who said he was disabled with a heart condition which made it impossible for him to run, said he left Enmore's Golden Barley Hotel around 2am on January 7, 2017. He was walking opposite Enmore 7-Eleven when he heard a noise. "I saw a lady being hit by another lady with what I then thought was a baseball bat," Mr Redwood said via videolink. "I thought it was a fight so I thought 'I'll go over'. "I noticed the lady ... walking across the road in my direction. "I noticed it wasn't a bat, it was an axe. "I knew at that point she was going to try to hit me with the axe." Mr Redwood said he removed his backpack and held it in his right hand. "As the lady approached me she took the axe and swung at me. "I swung my backpack to try and stop getting hit with the axe. "I managed to hit the blade of the axe with my bag, then she tried swinging again. "I blocked it again with my bag but it was hit so hard my bag fell out of my hands. "I tried to run across the road. I am disabled ... I fell flat on my face. "I turned around expecting an axe blow on my head.". Mr Redwood told Crown Prosecutor Daniel McMahon that if the first blow, which had "a lot" of force, had hit him it would have been in the region of his "upper chest". 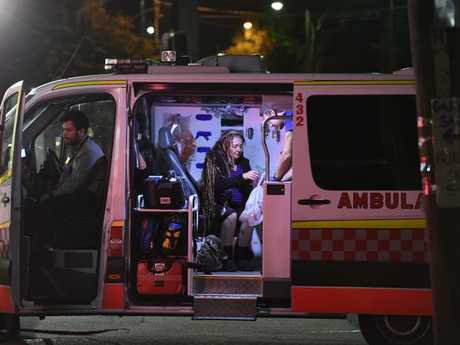 Ambulance officer Chloe Ashurst told the court she had arrived at the Enmore 7-Eleven at 2.39am on January 7 last year to find Ben Rimmer lying near the door. "There was an obvious amount of blood approximately 500ml on the floor ... covering his face and chest," she said. 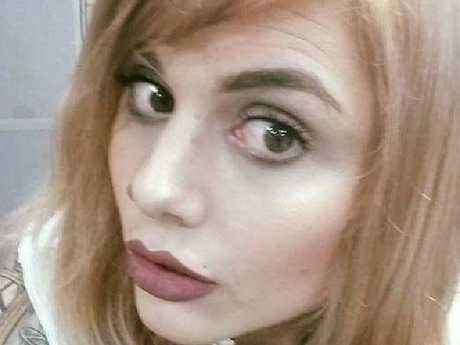 The trial of Ms Amati, now aged 26, on six charges including two of causing wounding or grievous bodily harm with intent to murder and one of attempting to do so, is in its second day in Sydney's Downing Centre Court. 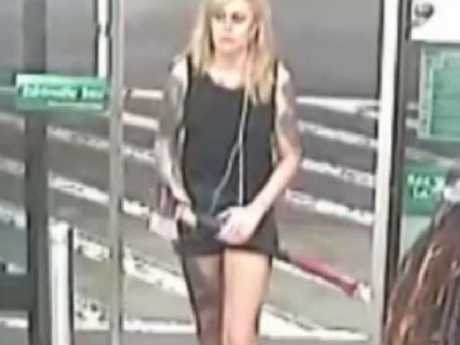 Crown prosecutor Daniel McMahon has told the jury that there was no dispute that Ms Amati had wounded or caused grievous bodily harm to two 7-Eleven customers in Sydney's inner west in the early hours of a Saturday morning last year. It was 2.19am on January 7, 2017 and Ms Amati had walked 450m on foot from her Enmore home where she had been listening to a song "with dark themes". Mr McMahon told the court that less than an hour before, Ms Amati had changed her Facebook status to read, "humans are only able to destroy or hate so that is what I shall do". It was also claimed that at 1.13am that morning Ms Amati sent a Facebook message to a woman she thought had rejected her saying "one day I am going to kill a lot of people". But Ms Amati's defence barrister Charles Waterstreet told the jury that although they would see video footage of Ms Amati, that at the time she was "out of her mind". "There is no doubt that the body of Evie Amati is in the CCTV … but by the time she picked up the axe, where was her mind?" Both the Crown prosector and Mr Waterstreet said that Ms Amati had been out drinking and taking drugs with three other women but had left her companions and gone home before entering the 7-Eleven. Inside the store were two customers, Ben Rimmer who was buying a pie, and Sharon Hacker who was buying milk. "[Ms Amati] did a lap of the store, passing Ben Rimmer before approaching the vicinity of the checkout," Mr McMahon told the jury in his opening address on Monday. "Mr Rimmer and the accused exchanged a few words during which he briefly touched the axe she is holding in front of her body, waist height with two hands. Alleged axe attack victim Sharon Hacker leaves after giving evidence at the trial of Evie Amati at the Downing Centre District Court. Picture: Ben Rushton. Ms Hacker told the court how she had gone to the a store to buy milk and had paid for it and was putting change into her wallet when she heard a sound like a "whoomp". She was then aware of a feeling in her head, "I saw a woman in her 20s … carrying an axe with a wooden handle. "That's when I realised, oh, OK, I've just been struck in the head with an axe." Ms Amati’s lawyer said transition to a woman had caused her excruciating pain. Alleged axe attack victim Benjamin Rimmer at court on Monday. Picture: Ben Rushton.